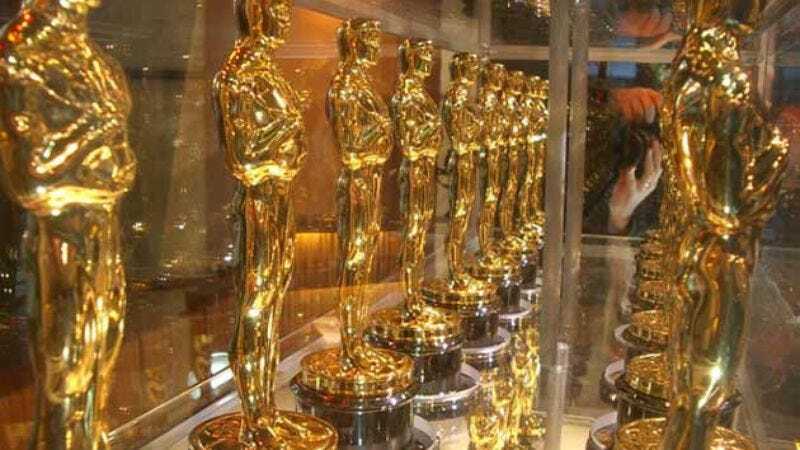 Reuters reported this morning that the producers of this year’s Oscars presentation ceremony are trying a new tactic to liven up the show and prevent the usual endless sequence of “I’d like to thank everyone else who worked on this film, by name and title, in order…” speeches. At the annual lunch for Oscar nominees, awards-show producers Adam Shankman (director of Hairspray) and Bill Mechanic explained that this year, they want nominees to write two speeches: the public one for the cameras, in which they should “share your passion on what the Oscar means to you,” and one for a behind-the-scenes ceremony, where the winners can face a special “Thank You Cam” and gush about the awesomeness of anyone they want. Shankman said the Thank You Cam footage would be available online, so celebrities can post or e-mail links to whomever—presumably all the thanks recipients, since most of the rest of the world won’t care. Mechanic and Shankman apparently stopped short of suggesting that nominees’ mics would be cut off if they veered into generic “I’d like to thank…” territory, but Mechanic did say they were “the single most-hated thing on the show,” and that they want this year to be livelier. Sadly, they showed footage of Renée Zellweger’s Cold Mountain Best Actress award speech as a sample of what nominees should try to emulate, rather than showing Roberto Benigni’s chair-climbing, arm-flailing freakout, or Jack Palance’s one-armed push-ups routine. That said, the move by itself opens up some potentially intriguing possibilities. Given 30 to 45 seconds and the social obligation to thank everyone possible, Oscar-winners have always had a safe, non-embarrassing, generic fallback speech practically written for them in advance. Robbed of that option and forced to come up with their own original ideas for speeches, some of them might actually let their real personalities show through a little. If nothing else, it might be worthwhile to see who ignores the instructions and defaults to the forbidden thank-you speech, or alternately, how far people will go to be original and interesting when given the direct challenge to do so. With a little luck, this might be the most enjoyably awkward Oscars ever.